Frequently asked questions about Pete Nelson's treehouse design and build company, Nelson Treehouse and Supply. Click the questions below to learn more about Nelson Treehouse. Our costs vary widely depending on the range of our services required, as well as the location and scope of your treehouse. Our current baseline price of fully designing and building a custom treehouse is approximately $300,000. The design portion of our services constitutes about seven to ten percent of that total price. In other words, the total price of your treehouse is equal to our design services costs plus the cost of our fixed-bid construction contract. Our average treehouses range from 200 to 500 square feet and can include most amenities of a typical "ground" house. Click here to learn more about the steps and costs of our design and build process. Treehouses within a one-hour drive from our location in Fall City, WA may not be subject to the logistical costs of crew accommodations associated with long-distance builds. Obtaining a building permit in your jurisdiction may be required. Costs associated with this process are similar to typical residential construction. We strongly recommend researching the regulations of local building authorities regarding treehouses, as it varies from place to place. Please review our FAQ section on permitting (below) for more information. Our range of services can be customized to fit your goals and budget. We encourage all those interested to submit an inquiry here. How do I get a Nelson treehouse built? We invite you to submit an inquiry so we can learn about your vision and determine if Nelson Treehouse and Supply would be the best fit for your project. We review each inquiry thoroughly, so ask for your patience while you await a response. If your project is an excellent fit with Nelson Treehouse, we will move forward with scheduling a site visit. Please be aware that due to the high volume of requests, the wait time for our full-scale design and build services may be significant. Hang in there! We care deeply about your timeline and do our best to accommodate it. Click here to learn more about the steps and costs of our design and build process. Can your design services be contracted independently from your construction services? Yes, our design services can be contracted independently of our construction and general contracting services. Our independent design services range from creating only a conceptual design, to producing a full set of permitted architectural drawings in partnership with engineers. With some independent design projects, we also assist with the installation of hardware onsite before leaving the remainder of the build in the hands of your construction team to complete. If you are interested in contracting our design services, please submit an inquiry here. And to read more about the steps to our design and build process, please click here. A fully designed-and-built Nelson treehouse is out of my budget. What can I do? If a fully designed-and-built treehouse is out of your budget, please don't despair—we have other avenues available for you! We offer consultations, specialized hardware, plans, and other supplies to support you in building your own treehouse. You might also consider contracting only our design services and/or purchasing our plans, and then hiring a local contractor to build the treehouse. We've supported many clients in building their dream treehouses without making use of our full-scale design and build service. Do you build treehouses as full-time residences? We specialize in elevating the craft of treehouse-building to accommodate large-scale projects. However, we remain mindful that treehouse-building is, at its core, an art of small-space design and construction. We do design and build treehouses that function as full-time or part-time residences. Our clients who choose to live full-time in a treehouse are typically committed to leading a semi-rustic, tiny-house lifestyle. Our average treehouses range from 200 to 500 square feet and can include most amenities of a typical "ground" house. That being said, our treehouses are emblematic of small-scale living—we make an effort to downsize most of the features to fit within the constraints of building in living organisms. Yes, we can integrate a kitchen, bedroom, full bathroom, and living room into your treehouse—but we do not build 1,000+ square-foot, tree-supported structures with expansive floor plans fit for a full family's lifestyle. Please note that permitting for a full-time residence in the trees is similar to the permitting process for a typical ground house and may require considerable time and preparation. We strongly recommend contacting local building authorities to understand regulations pertaining to treehouses on your property. Please see the next FAQ (below) for more information on permitting. In order to install amenities like running water and electricity in your treehouse, all necessary infrastructure (e.g., a septic system, water service, and electrical service) must be established on the location of the treehouse before construction begins. The permitting and installation of this infrastructure on the site of the treehouse will be your responsibility, and is above and beyond the purview of our design and build services. However, once the necessary infrastructure is installed onsite, Nelson Treehouse and Supply will oversee installation of these amenities within the structure. How does permitting work for treehouses? During the design stage and prior to building, it's important to research code standards, zoning regulations, and permitting pertaining to treehouses in your local jurisdiction. We recommend beginning this process by visiting your local building department and speaking with a building official. In most scenarios, obtaining a permit for a treehouse is similar to the process for a ground house. In these cases, it may be necessary to consult an architect and engineer to produce construction documents and drawings. Regulations differ widely per jurisdiction; contact your local building and zoning departments to understand the regulations specific to your area. If you plan to rent out your treehouse and/or use your treehouse for any commercial purpose whatsoever, you may be subject to different code standards and zoning regulations than if your treehouse is for private use only. While you're researching your local regulations, make sure to consider how your project will affect your neighbors. Will your new, lofty view invade their privacy? Will your structure obstruct their existing view? Undoubtedly, you'll want to be conscientious of the impacts to your neighbors. It's also savvy to consider your property options. If you're looking for property with the intention of building a treehouse, you have the luxury of checking the building codes for each area you are considering. This may enable you to buy property where you know you will be allowed to build a treehouse. What is the purpose/intended use of the treehouse? Will the treehouse have utilities (e.g., heating, plumbing, electricity)? What is the square footage of the exterior and interior? What is the height from ground to top of roof? Although permitting may seem daunting, Nelson Treehouse and Supply successfully obtains treehouse permits across the country for all the projects that require it. The building code is not intended to inhibit innovative ideas or technological advances. We have found that the vast majority of jurisdictions support our safe and sustainable science of treehouse-building. Where can I find information and resources about best practices of treehouse-building? We have more videos on treehouse technique, tips, and timelapses on our YouTube channel. For more in-depth information, we recommend purchasing our Treehouse Instructional Guide which covers everything from tree selection to platform design. What are some materials and products regularly used by Nelson Treehouse and Supply? Treehouse hardware: Be in a Tree (the "Supply" side to Nelson Treehouse and Supply) offers the specialized hardware required to build safe and enduring treehouses. We use this same hardware in all of our builds across the country. If you are considering purchasing hardware, we strongly suggest you begin by ordering our Instructional Guide. Fasteners: Nails are a thing of the past! We use Screw Products Inc. for almost all of our fasteners. These are also offered at Be in a Tree. Reclaimed materials: We seek to use reclaimed materials as often as possible—integrating reclaimed wood resonates with the spirit of treehouses, as it is an environmentally sustainable practice. We also find that reclaimed wood imbues the treehouse with a beautiful sense of history and character. Hog wire used for railings and fencing: The material you are looking for is what we call "hog wire" or welded wire fabric. It is a ¼" gauge with 4" x 4" square spacing. Your nearest lumber yard or feed store should be able to help you find the right stuff. We encase it in lovely western red cedar to form a panel. For tips on creating your own hog wire railing, visit our DIY tutorial! Finishes: Polyurethane is generally used for interior finishes. However, it is important to note that it has a long dry time and leaves a lingering odor. That being said, it does leave a beautiful sheen and protective layer on the wood. To protect the exterior of our treehouses, we prefer penetrating oil products. Latex paint is also fine for exterior finishing, but we like to showcase the natural beauty of the wood rather than cover it. We favor brushing or rolling products onto the surface, which encourages the product to soak into the grain of the wood (sprayers can be wasteful). Check with your local building supply store for specific product recommendations. Nets: The net structures featured on Treehouse Masters are made by Dream Nets Northwest, using recycled fishing nets. At this time, we do not have any instructional plans for them. 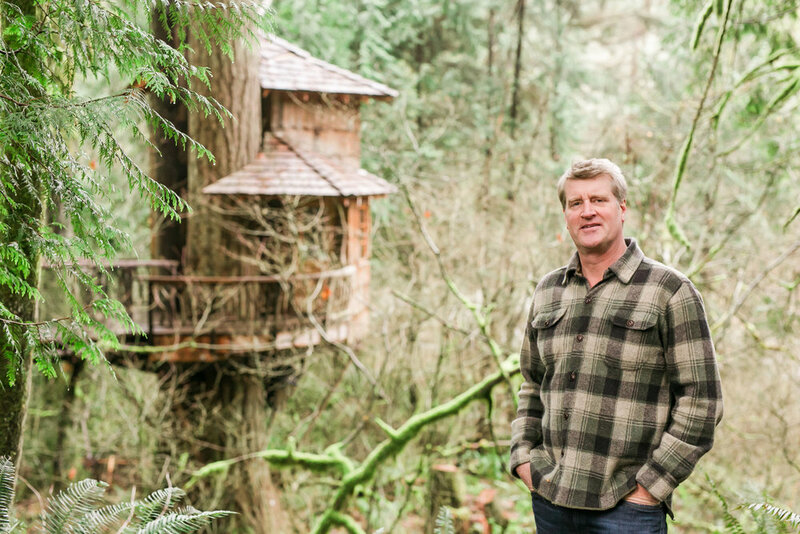 Where can I buy Pete Nelson designed plans for treehouses? Please visit our online store to browse all treehouse plans designed by Pete Nelson for DIY-builders. Our online store, called "Be in a Tree," is your one-stop shop for all things treehouse! How do I get a treehouse consultation? If you are interested in scheduling a consultation, please begin by submitting an inquiry. This will enter your request into our system—we review each inquiry thoroughly, so please be patient while awaiting a response. We look forward to speaking with you! For information on our consulation prices and process, please visit our Consult page. How do I decide which tree(s) to build in? The design process begins with proper selection of healthy trees that will continue to thrive when connected to a treehouse. A structurally sound treehouse in a well-maintained tree has the potential to last as long as the tree. The health of your trees is crucial to the safety and longevity of your treehouse. We strongly recommend that you enlist the help of a certified arborist to evaluate the health of your trees. An arborist may also identify any work needed to prepare the site for your project. Once the treehouse is complete, arborists might be able to assist with tree maintenance. Bottom line: healthy trees = a happy treehouse! Good resources for arboriculture information and arborist referral services are the International Society of Arboriculture and, for those in the Seattle region, PlantAmnesty. For more in-depth information on the trees that we recommend for treehouses, please refer to our Instructional Guide. What do I need to know about designing and building a treehouse? For in-depth information on treehouse design and build, please refer to our Instructional Guide. Engineering your treehouse: We highly recommend consulting a structural engineer when designing your treehouse to ensure that it is structurally sound. An engineer will be able to help you with your platform design, advising you on beam sizing and placement. Engineers will also consider live load (weight of humans, their dogs, and the occasional goat), dead load (weight of structure), and snow load (weight of snow). If you live in an area that has high winds, earthquakes, and/or considerable snowfall, engineering will be a critical step to achieve structural integrity. Engineering may also be required for a building permit in your area. Tree-through structure: We have found that designing treehouses with trees penetrating the roof can be problematic, as there is no reliable way to create a fully waterproof seal between the roof and the tree. If you decide to penetrate the roof, we recommend that you use a flexible collar that fits around the tree. The key is flexibility in the collar so that the tree can move and will not be girdled over time. Make sure that any water traveling towards the opening is diverted by a valley or "cricket." Lightning: If your treehouse is the highest point in the surrounding area, lightning may be a concern. In this situation, we suggest consulting with a local lightning rod contractor. Snow load: If you live in an area that receives considerable snowfall, consulting with an engineer will be a critical step to ensure structural integrity. Heavy-limb hardware may also be required to withstand the weight of snow loads. Knee braces: There is no "one-size-fits-all" single-tree knee brace. The typical knee brace is composed of a piece of timber (4x6, 4x8, etc.) oriented in a diagonal position. It is attached at the top (the structure end) and bottom (the tree end). We do not recommend connecting wood to wood—it's best to use a metal wood strut between knee brace and tree. We suggest you read our Instructional Guide for more detailed information. Tree layout: Tree layout is one of the most important factors in designing your dream treehouse. For our recommendations on this process please refer to our Treehouse Instructional Guide. Plans: For DIY-ers with experience in skilled carpentry, we have plans that can be modified to fit your unique tree layout. Additionally, we offer consultations to help with design modification. Hardware: We offer our specialized hardware for sale on our online store. We also offer hardware kits that correspond with our plans, and can fabricate any custom hardware you need for your project. Our treehouse attachment bolts (TABs) have been tested in an International Code Council-accredited laboratory. If you are considering purchasing hardware, we strongly suggest you begin by ordering our Instructional Guide. This guide contains detailed information on hardware use and installation. Bridges: Since bridges involve a highly situational application, Nelson Treehouse and Supply does not offer consultations on the matter. We recommend working with Seattle Bridge Builders for your bridge project. Fall protection: Wear full-body harnesses clipped in to safety lines. Tool safety: Keep tools on lanyards to prevent them from falling. Awareness of site: Always be aware of branches, tools, and loose materials above you, as well as people below you. Scaffolding: Set up scaffolding for ease of access. Wrap-around decks: Treehouses with wrap-around decks are easier to access—the decks function like scaffolding and can provide simple access for future maintenance. Rope access: Climbing ropes is challenging. When possible, rely on scaffolding instead of ropes. What if I don't have trees? We hear you: not everyone has access to ideal treehouse trees. If your trees are small or otherwise unsuitable for bearing the load of a treehouse, we do not recommend building in them. However, it is possible to achieve a structure that is a treehouse in spirit by posting down to create an elevated house. We recommend using logs or faux trees as posts for "treeless" projects. These can look just as attractive as real trees and hold a considerable load, if installed correctly. "I don’t subscribe to the idea that using posts does not make a treehouse. A treehouse is an experience. If you need a post to create the experience of being in the trees, then use it. The post should be celebrated." Where can I stay overnight in a treehouse? Established in 2006 in Fall City, Washington, TreeHouse Point is Pete and Judy Nelson's flagship overnight retreat and event center. Nestled 30 minutes east of Seattle and just minutes from the world-renowned Snoqualmie Falls, TreeHouse Point is emblematic of the breathtaking natural beauty of the Pacific Northwest. The verdant grounds are home to six iconic treehouses, a central lodge, a multi-purpose event space, and two cedar-lined bathhouses. TreeHouse Point also offers guided tours and hosts weddings and elopements year-round. Learn more at treehousepoint.com. Treehouse Utopia in Texas Hill Country is the outcome of a partnership between Pete Nelson and Laurel Waters, chef and owner of the renowned Laurel Tree Restaurant. With its four rentable, luxury treehouses and natural splendor, this romantic retreat exudes magic. Laurel has personally curated the interiors of all the treehouses, integrating many historic items she's collected on her travels through France. Treehouse Utopia truly lives up to its name, with sweeping views of the Sabinal river, prehistorically sized trees, and the starlit sky that stretches over Hill Country. Learn more at treehouseutopia.com. For a full list of all the Nelson treehouses that offer opportunities for public visits, check out this blog post. Can I visit a Nelson treehouse? The short answer is: Yes! We’ve built many treehouses across the country (and one in Norway!) that offer the opportunity for public visits. The longer answer is: the degree of public “openness” of each of the treehouses varies. Some of our treehouses in public parks offer free visits year-round; others are at private companies that host tours, overnight stays, or other events for a fee and on a limited basis. Keep in mind that many of these treehouses allow visits by advance appointment only. Please plan your visit in accordance with each venue’s restrictions and guidelines. Do you repair or remodel treehouses? If so, how much does this cost? Although we primarily build custom treehouses, we occasionally do treehouse repairs and remodels. The first step is a consultation to determine the scope and costs of the project. Beyond the initial consultation costs, we would base the repair and remodel costs on time, material, and travel costs. We invite you to submit an inquiry so we can learn about your repair and remodel needs and determine if we would be a good fit for your project. Do you make treehouse charitable contributions? Thank you for your interest in a charitable contribution from Nelson Treehouse and Supply. To be considered for a contribution, you must be a non-profit organization. Because of the costs and logistics involved in building a custom-designed home in the trees, we do not provide donations of full treehouses. We strongly believe in and have a long history of supporting the community around us through charitable activities. However, because we are a small, family-owned business, and because of the tremendous number of inquiries we receive, we cannot fulfill every request. In the continued spirit of goodwill, we have made the decision to support several local organizations with whom we have a special kinship. Recipients of our charitable contributions for 2019 have already been selected. What is Treehouse Resort and Spa? And how can I plan a visit? Treehouse Resort and Spa will be a destination retreat located in the beautiful Pacific Northwest and centered on holistic wellness, play, and relaxation. The resort is not yet open to the public. For more information, please visit treehouseresortandspa.com. If you have reviewed the information on our website and would like to submit an inquiry for your treehouse project, please complete our online questionnaire. For all other questions and comments, please email info@nelsontreehouseandsupply.com. For information on touring, staying overnight, and/or hosting an event at TreeHouse Point in Fall City, WA, please visit www.treehousepoint.com. For information on staying overnight at Treehouse Utopia in Utopia, Texas, please visit treehouseutopia.com. Interested in our services? If you have reviewed the information on our website, we invite you to submit an inquiry so we can learn about your vision and determine if Nelson Treehouse would be a good fit for your project. We review each inquiry thoroughly, so please be patient while awaiting a response.